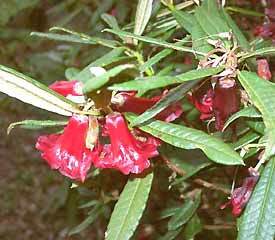 Flower/Truss Description: Tubular campanulate, rose to deep crimson, sometimes a mix of orange, yellow or pink. Lax truss has 4-7 flowers. Foliage Description: Leaves narrowly elliptic to oblong, up to 4½" long, patchy rust colored indumentum.